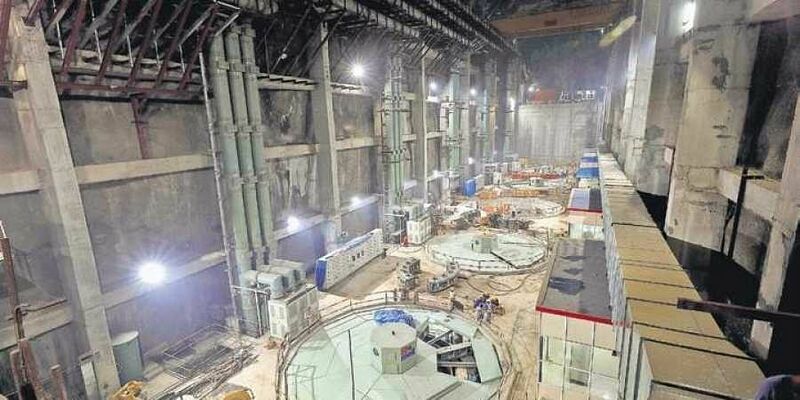 The world’s biggest underground pumping station was constructed by engineering giant Megha Engineering and Infrastructures Ltd.
HYDERABAD: A high-speed dry run of the motor in the underground pumping station’s Unit-1 of Package-8 of the Kaleshwaram lift irrigation scheme was held on Friday. Previously, the dry run of three motors had been completed successfully and this is the fourth motor of Unit-1. The world’s biggest underground pumping station was constructed by engineering giant Megha Engineering and Infrastructures Ltd (MEIL) as part of Package-8 of KLIS. The dry run was monitored by government’s adviser Penta Reddy, and supervised by irrigation chief engineer Venkateshwarlu, superintending engineer Venkataramulu, executive engineer Sridhar, MEIL pump house in-charge Puranachander Rao, site in-charge Ramakrishna and BHEIL engineers. Package-8 consists of two pump houses and seven motors. Motors from one to five will come under Pump House-1 and motors six and seven under Pump House-2. Previously, the dry run of 2, 4 and 5 motors was held successfully. At present, Unit-1 (Motor No. 1) high-speed dry run process was going on. The full capacity of Motor-1 is 214 rpm (revolutions per minute) and the discharge capacity is 89 cumecs. Power consumption by this motor at full water load is 139 MW. This motor consists of 115 metres of pumping head, according to a press release from MEIL.